I’m still working through the mass quantities of squash from Friday’s Fall CSA. Because I’ve been spending so much time with squash, I had a revelation today that I would like to share. I love – really, really love – winter squash! Who knew? As I ate the last of my leftover Baked Winter Squash Pasta for lunch today, I fully realized the awesomeness of winter squash. Squash is pretty. Squash is tasty. Squash is healthy! So for my next squash recipe, I was inspired by the Coconut Curry Soup at Fresh Veggies in the Desert. I am not a fan of coconut, but the combo of squash and curry sounded yummy, so I decided to experiment. 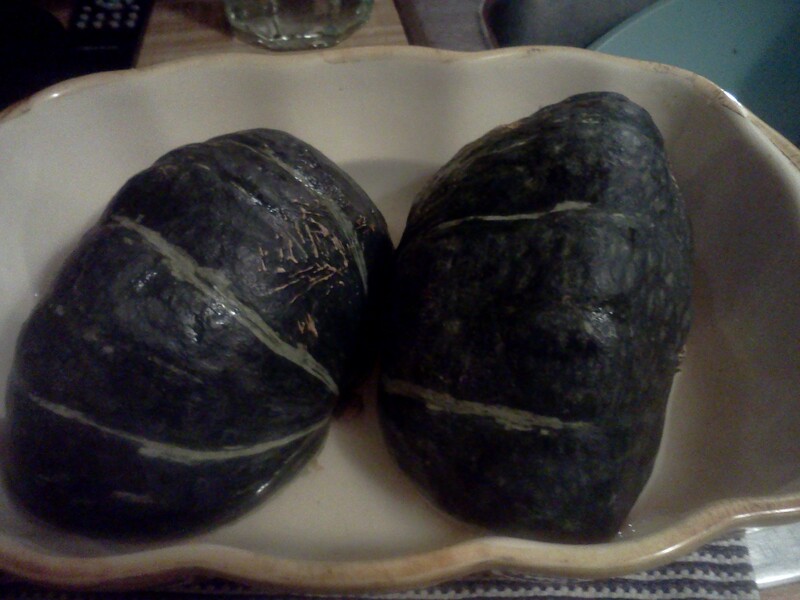 I started by roasting one of the kobacha squash from my CSA. This is my new favorite squash. It’s a little weird-looking, but that’s part of the fun. It has a sweet taste, the texture is velvety, and it’s such a bright orange! Love it! While the squash was cooking, I cut up some carrots and onions, and sautéed them in a heavy-bottomed pan with olive oil. I added salt, pepper, and curry powder to the veggies. (As soon as I added the curry, it started to smell fantastic!!) After they cooked for about 10 minutes, I added some chicken stock. 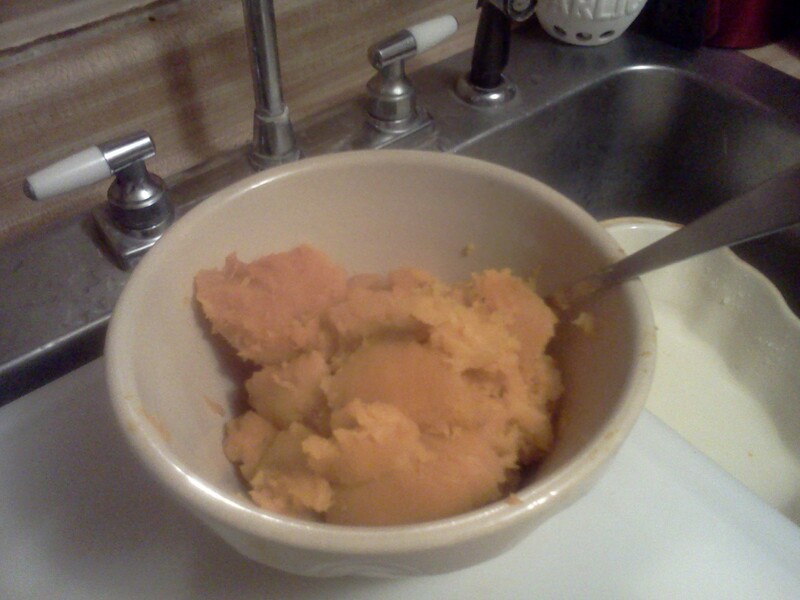 When the squash was done, I scooped out the insides and put them aside in a bowl. I blended the squash and the chicken stock/veggie mixer in two batches. 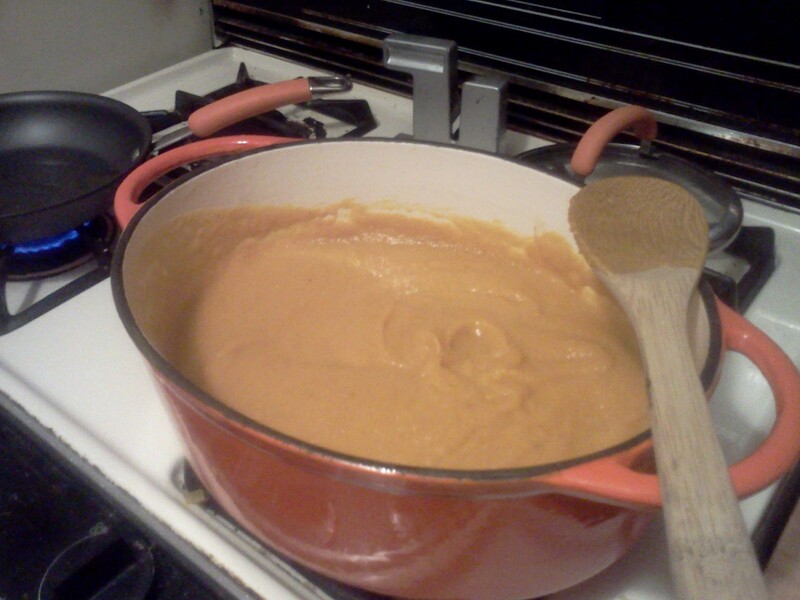 I wanted a really smooth soup, so I blended it for a couple of minutes, then added it back to the pot to simmer. Such a pretty color! I felt like the soup needed something added to it, so I sautéed some shrimp with olive oil, salt, pepper and smoked paprika. 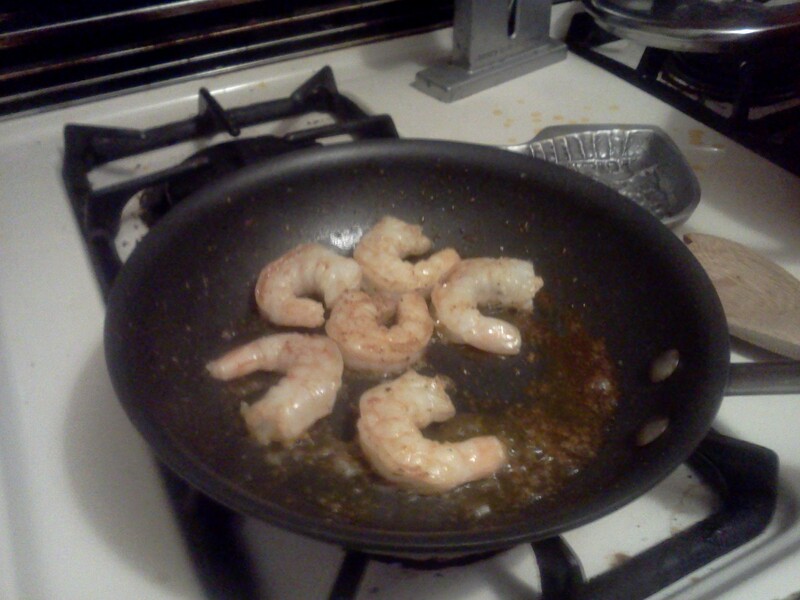 I love the bags of frozen, easy peel shrimp. It’s such an easy, healthy add-on to a meal and it only takes a couple of minutes to cook! 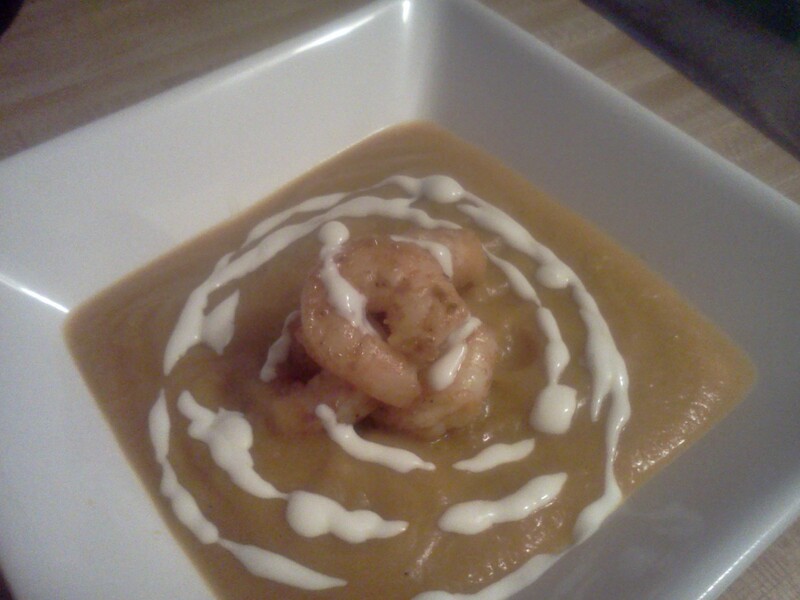 I originally used smoked paprika for the color, but it turns out that the smoky flavor went wonderfully with the soup. It’s nice when a plan comes together. I topped the whole thing with a drizzle of sour cream just to make it look pretty, and there it is! I was surprised by how much I enjoyed this dish. Has anyone else ever made a recipe that you weren’t terribly excited about, but then ended up loving? Isn’t it a nice surprise? Preheat the oven to 425 degrees. There are different ways to cook squash, but I’ve had good luck with this method: Cut the squash in half and scoop out seeds. 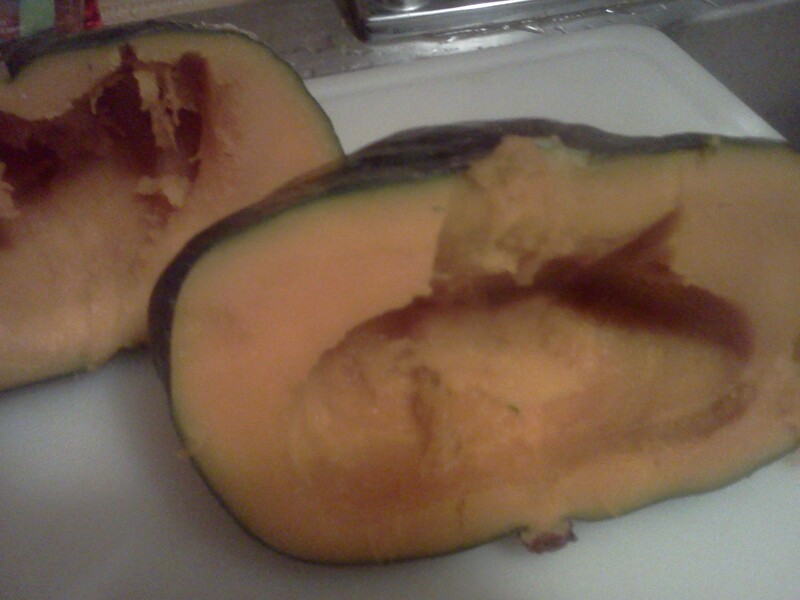 Place the squash, skin side up, in a casserole dish with about 1/2 inch of water. Cook until the squash is soft – for this recipe, it took about an hour. When you remove the squash from the oven, let cool for a few minutes. Scoop out the cooked squash and set aside. Add olive oil to a heavy bottom pan over medium heat. Add carrots and onions, salt, pepper and curry powder and cook until soft (about 10 minutes). Add chicken stock and continue to cook for 5-10 minutes. Blend half the squash with half the carrot/onion mixture until smooth. Blend the second half (unless you have a really big blender and you can fit it all in one batch). Return to the stovetop and simmer. This entry was posted in CSA, Dinner and tagged curry powder, curry squash soup, kobacha squash, shrimp, soup, squash, squash soup, winter squash on November 13, 2012 by Melissa. It looks great. Yesterday, I had a big aha with my spaghetti squash. On epicurious they suggest piercing it in several places with a knife and then throwing the whole thing in the microwave for about 10 minutes. It was amazingly efficient and I would’ve never thought to do it. What an awesome idea! Thanks! Melissa, I think you missed your true calling. As I read the directions and see the pictures of the steps taken I admire the concise and entertaining process. Keep on. I was a lucky one that actually got to taste this wonderful soup! Thanks for sharing it. Perfect for a cold day. I agree, keep it up! I am definitely going to try to make this one. We just got two more winter squash in our CSA!